1. Ask Questions The burning question of the day - did you have more snow over the weekend? I woke to several inches on Sunday morning (I’ve not done that for a few years) and went out for an early walk in the woods before the dog walkers could spoil it. It was heavenly. Until two joggers ran past who ruined the day for everyone with their excessive showing off. Who jogs in six inches of snow except frightful exhibitionists? 2. Catch up with Garden Chores Snow has stopped play. Adventures I’d planned in my greenhouse have been halted because I refuse to brave the garden until I’m sure I won’t freeze to death. 3. Bond with Your Cat The cat is intensifying her campaign for larger, more frequent meals and pickets me every 3 hours. If she could make a placard, she would. But fortunately she’s dim as a stick and has to employ staring as her only means of inducement. 4. Gossip P—— has a crush on a Swede. I'm not surprised. I suspect Scandinavia is his spiritual home, so I’m all in favour. Indeed I think he would be far happier in a foreign country and, by emigrating, will avoid the long awkward disappointment of spending a lifetime trying to fit in with people whom you neither understand nor are understood by. (I feel that sentence would have been easier to write and read in Latin. But I could never really fathom Latin. When it came to translating, I was always getting the hold of the wrong end of the stick, or rather sticking of the wrong hold of the end.) 5. Re-engage with the Real World As you see, I’ve stopped making sense to anyone but myself. I’m desperately reading newspapers and listening to endless radio in an attempt to bridge the gap between myself and the outside world, but it’s not helping. Few people in Sheffield can read and none of them know who the Archers are. 6. Catch Up with Soaps I’ve started listening to the Archers again for the first time in years. (I boycotted when they threw Nigel off the roof.) I’m having trouble picking up the threads. From what I can tell, Caroline and Nicky are dead. Was there some sort of cull, like with badgers? Jennifer hasn’t changed a bit. I can’t wait until a rare nerve agent is found on Brian’s land. He’s the type to stockpile nerve agents illegally. 7. Learn a New Language Between the Archers and pottering, I’m attempting to learn Norwegian. Don’t ask me why. There is no reason. Men det er veldig bra. 8. Sum Up Your Current Situation That’s it really. The Archers, Norwegian and pottering. I shall get back to work after Easter, but until then, I’m happily drifting. I may pay another visit to L——. I had such a lovely time last time. Who knew holidays could be fun? The burning question of the day - did you have more snow over the weekend? 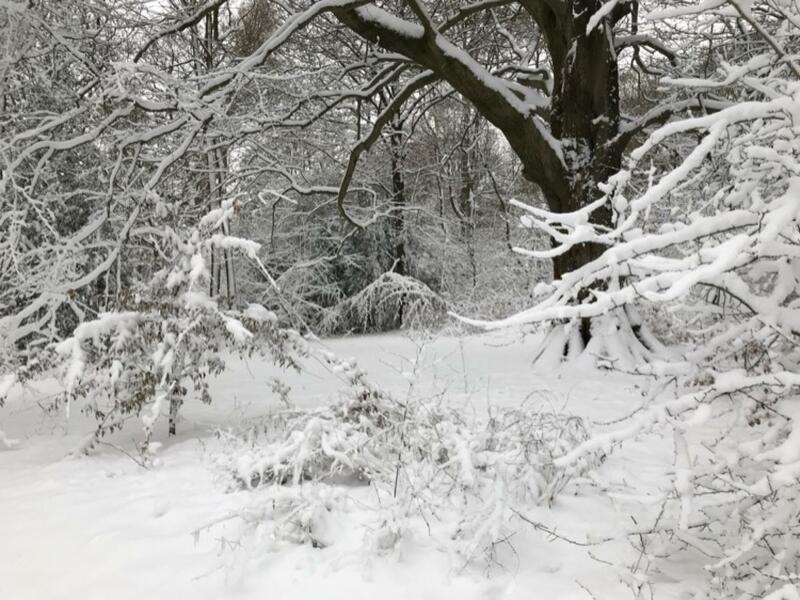 I woke to several inches on Sunday morning (I’ve not done that for a few years) and went out for an early walk in the woods before the dog walkers could spoil it. It was heavenly. Until two joggers ran past who ruined the day for everyone with their excessive showing off. Who jogs in six inches of snow except frightful exhibitionists? Snow has stopped play. Adventures I’d planned in my greenhouse have been halted because I refuse to brave the garden until I’m sure I won’t freeze to death. The cat is intensifying her campaign for larger, more frequent meals and pickets me every 3 hours. If she could make a placard, she would. But fortunately she’s dim as a stick and has to employ staring as her only means of inducement. As you see, I’ve stopped making sense to anyone but myself. I’m desperately reading newspapers and listening to endless radio in an attempt to bridge the gap between myself and the outside world, but it’s not helping. Few people in Sheffield can read and none of them know who the Archers are. I’ve started listening to the Archers again for the first time in years. (I boycotted when they threw Nigel off the roof.) I’m having trouble picking up the threads. From what I can tell, Caroline and Nicky are dead. Was there some sort of cull, like with badgers? Jennifer hasn’t changed a bit. I can’t wait until a rare nerve agent is found on Brian’s land. He’s the type to stockpile nerve agents illegally. Between the Archers and pottering, I’m attempting to learn Norwegian. Don’t ask me why. There is no reason. Men det er veldig bra. That’s it really. The Archers, Norwegian and pottering. I shall get back to work after Easter, but until then, I’m happily drifting. I may pay another visit to L——. I had such a lovely time last time. Who knew holidays could be fun?